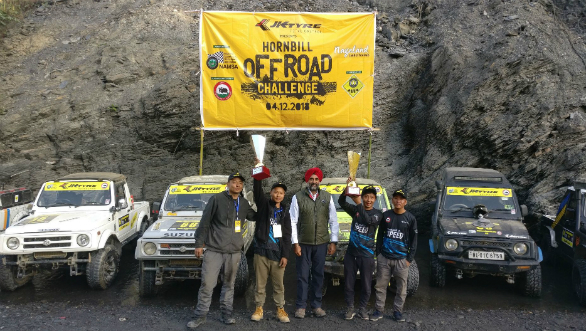 Aviu Rutsa and co-driver Neiketoulie Meyase along with Rudkuobetvo and Pete won the JK Tyre Hornbill Off-Roading Cup held near Kohima, Nagaland on December 4, 2018. This was the first time such an event was being held, as part of the seven-day long Hornbill Festival. Participants had to negotiate a 1.5 km course that comprised six grueling challenges and obstacles. The event was being held as part of the JK Tyre Hornbill Motor Rally. The rally itself was held after a gap of three years, with Gagan Sethi and Sabatullah Khan winning the ninth edition held on Monday. The event was held over a 55 km course around Kohima in a TSD format. In the Off-Roading Cup, the first runners up were Yanger Lushang/ Maken Lepden and Bento Swu/ Bovito Kiho while Ikweithing (Justin)/ Kenrak Thou and Irietui/Elu took the second runners-up trophy. Each team comprised of two cars manned by a driver and a co-driver. Other prizes were awarded too. Abemo Yanthan was adjudged the best spotter while Aviu Rutsa also won the prize for best off-road rig. The Hornbill Festival, during which these motorsport events coincided, is filled with cultural performances, ethnic food courts, handlooms and handicrafts bazaars, film and art festivals, fashion shows and a national rock contest.